When my wife and I finally finished building our house, it was time to focus my attention on the garden, specifically my kitchen garden. 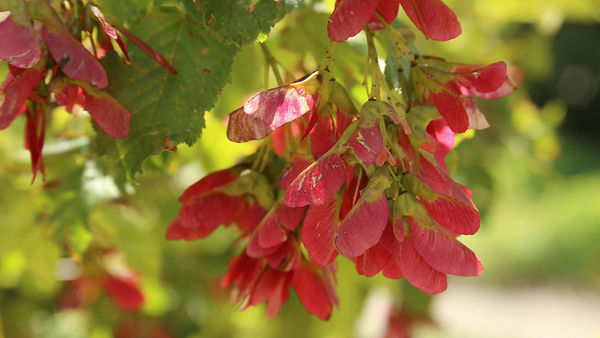 During the house construction, I did have a vegetable plot, but it was quite small, and more important, it lacked a good way to water. For the two previous seasons, I had used an old 1-inch well line I’d picked up at a local plumbing junk yard. The line connected to the spigot at the house and ran over the ground down the hill to the garden. 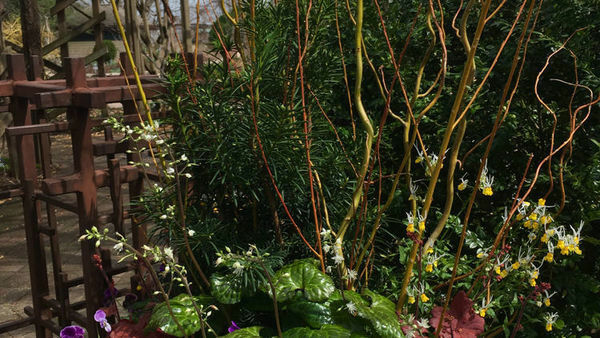 This solution was neither attractive nor permanent, so when I set out to design and build a new, enlarged kitchen garden, I planned to add an irrigation system, too. Because my primary goal was simply to get water to my garden, I chose to go with a very basic setup. 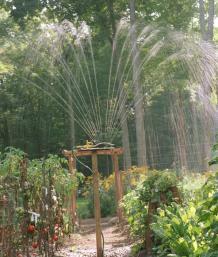 The actual watering would still be done with a sprinkler. But I also wanted a system that could be expanded in the future. With the help of a trench digger, the author got the 200-foot ditch dug in just three hours. One of the first questions I had to answer was how deep to bury the water line. If I didn’t want to have to drain the system each fall, I would have to bury it below the frost line, which is 42 inches deep here in my Zone 5 Connecticut garden. I also had to decide what kind of material I would use for the line, and how to connect the line to the house. Finally, there was one other obstacle, literally— the stone wall that runs along the base of the hill between the house and the garden. Somehow I would have to take the line under or through this. The answer to my first question came easily when I did a test dig on the hill where the line would go. After five sweaty hours of fighting with rocks and roots, I was only 3 feet into what would be a 200-foot-long trench. I quickly decided to bury the line just 1 foot deep and to drain the system each fall. 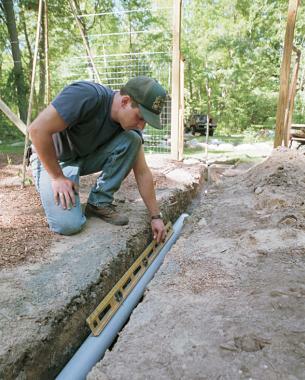 Before laying the line, check to see that the trench pitches evenly toward the intended low spot. 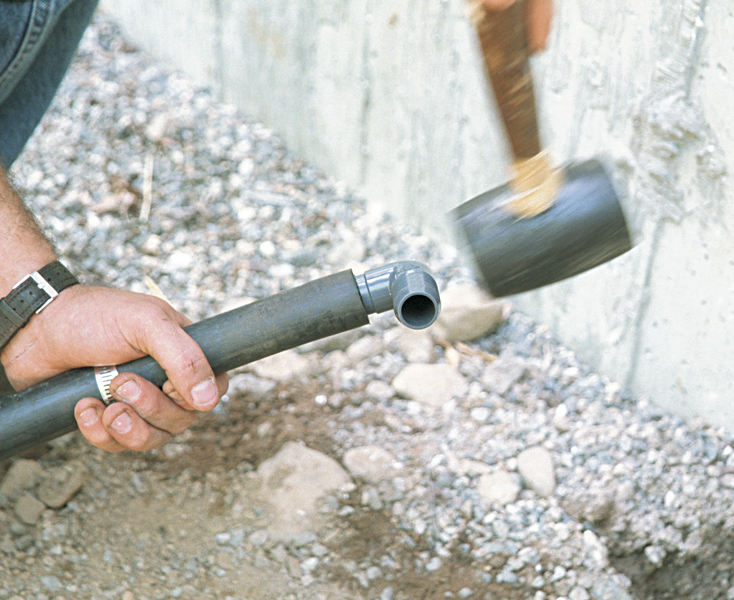 Laying a length of rigid pipe in the trench before measuring with a 4-foot level gives a more accurate reading. The trench should slope just slightly. My next step was to determine what kinds of connections I needed and where they would go. First I had to figure out where the low point in the system would be. That’s where it would all drain. My garden is downhill from the house, with a drop in elevation of almost 30 feet, which would allow gravity to drain the system. Because the land slopes to the center of the garden, I decided to install a drain valve there, along with a spigot, from which I could water the whole fenced kitchen garden (C on site plan). I also wanted a spigot outside the garden on the uphill side (B), so I could run a hose and sprinkler to my pumpkin patch and perennial beds. Finally, I needed a third spigot at the far end of the line (D) that, when opened, would let air in and cause the line to drain completely. All three of these connections would be housed in wooden boxes set in the ground, which would give me quick access to them. 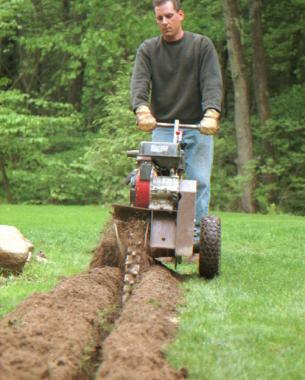 In addition, I’d need a few elbow connections because, although irrigation line is flexible enough to curve gently, it can’t make sharp turns. 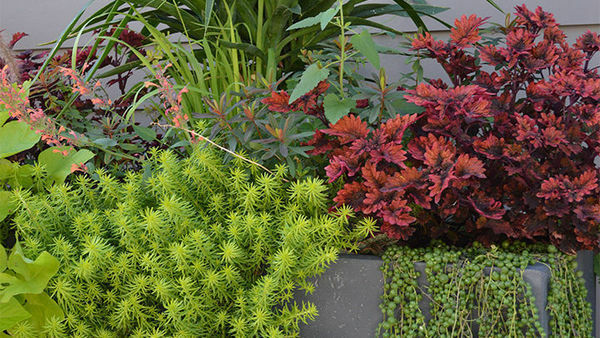 After I had a basic plan, I took it to a plumbing supply store that specializes in irrigation systems to make sure I had everything covered. They looked at my plan and said it was fine. I bought 1-inch PVC irrigation line, and standard PVC plumbing fittings for all the connections. With these decisions behind me, it was time for the real work to begin. A four-head spigot quadruples watering versatility. 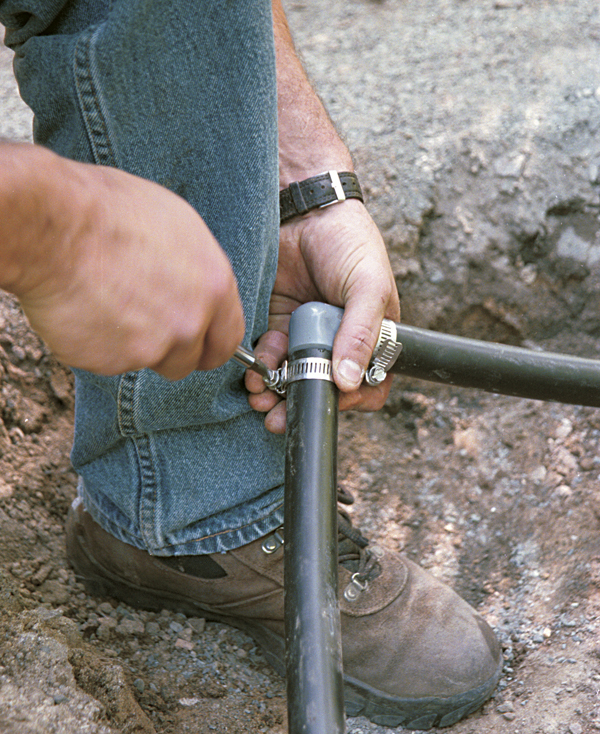 The flexible braided line, which joins the irrigation line to the spigot, is easier to disconnect than the stiff irrigation line. I knew going into this project that the most difficult part would be digging the trench that would contain the water line. After my trial dig, I decided to spend $75 to rent a trench digger to open a ditch 4 inches wide by 1 foot deep. Using this piece of machinery was still hard work, but I got the whole 200-foot trench dug in three hours. Once the rough trench was dug, I had to ensure that the bottom of it was properly sloped so there would be no unwanted low points in the line to hold water. I used a long piece of rigid plastic pipe left over from a previous project to help me determine that the slope was correct. I laid the pipe in the trench and set my 4-foot level on the pipe. In the areas where I needed to adjust the grade, it was just a matter of adding or taking away small amounts of dirt from the bottom of the trench. The connection boxes are simply bottomless wooden boxes with drop-in covers that sit flush with the top of the box. I made them out of 2×10 pressure-treated pine cut to 1-foot lengths so I would have a box 1-foot square by 912 inches deep. This gave me enough room inside to house a spigot. The box in the middle of the garden would need to be larger and deeper to accommodate both a spigot and the drain valve, so I made that one 12 inches wide and deep and 18 inches long. When the boxes were done, it was time to assemble the system. I did not cut the holes in the box sides for the pipe to go through at this point because I wanted to be sure I got them in the correct places. With the trench ready, the next step was to put all the connection boxes in the ground. To install each box, I dug a hole a few inches deeper than the box itself, and filled the bottom with 3 to 4 inches of gravel, so when I drain the line, the water has somewhere to go. I adjusted the level of the gravel bed so the box sits flush with the surface of the ground. Next, I unrolled the irrigation line and positioned it alongside the trench so I could determine the exact length of the run of each piece of line. After the line was laid out, I went back and cut it with a hack­saw wherever a connection would be, leaving a few inches extra for adjustments. To figure out where the holes in the boxes should be, I laid my level in the trench up against the box and put a mark on the side of the box where the level met the box. After marking all the boxes, I pulled them all out of the ground and drilled the holes with a 114-inch bit. 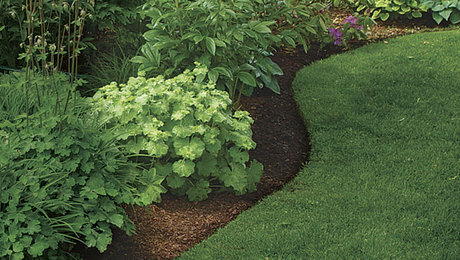 Although I had bought 100 psi (pounds/ square inch) line for the lower part of the project, I decided to reuse the 160 psi line I already had for the long run from the house to the first connection, near the edge of the garden. This turned out to be a mistake, because the thicker-walled 160 psi line was harder to get the fittings into. In retrospect, spending another $10 to have 100 psi line throughout would have saved me some bother. I started assembling the system at the house. 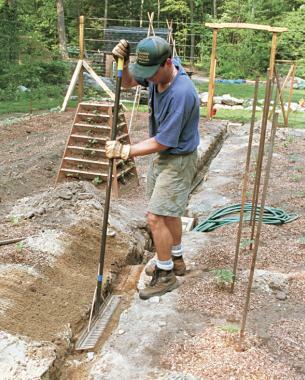 The trench comes right up to the foundation, so the line needed to go from a horizontal run to a vertical run to reach the main spigot on the house. To make the bend, I connected a 90-degree fitting to the end of the line. For the vertical run, I used a 3-foot section of 1-inch braided flexible line, which is a lot easier to disconnect at season’s end than the stiff irrigation line. 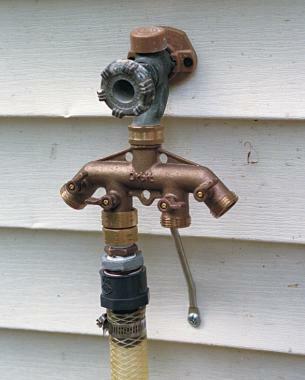 This is connected to a four-head spigot, which threads onto the main spigot on the house. The four separate heads allow me to have the main irrigation line always hooked up as well as to have other hoses connected. I then proceeded to my first connection box (B on site plan), making sure the line was lying on the bottom of the trench along its whole length. On either side of the box, I slid the ends of the two pieces of line through the holes, and slipped a clamp over each end. In this box I needed an elbow and a spigot, with a short piece of line in between. It’s cramped and awkward to work inside the box, so I made as many connections as possible outside the box. In this case, I fitted and clamped the elbow and the T-fittings into the short piece, then made the connection to the irrigation lines. This system required a series of connections in four locations; details are shown below. The line starts at a four-head spigot at the house (A). 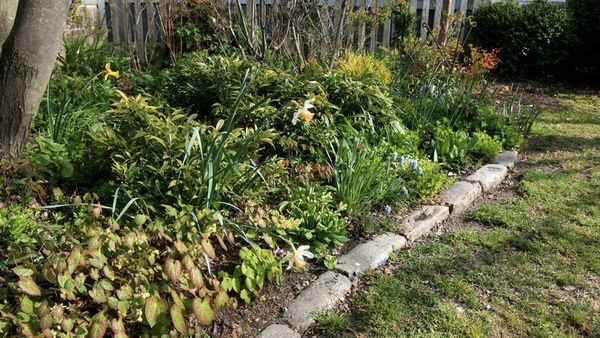 The author waters the garden from hoses attached to spigots at B and C. The spigot at D is needed to flush the system completely—of air at the beginning of the season and of water at the end of the season. To get a fitting into the irrigation line, it was sometimes necessary to heat the line slightly with a small propane torch. I was careful to heat all sides evenly and only enough to get the fitting in. 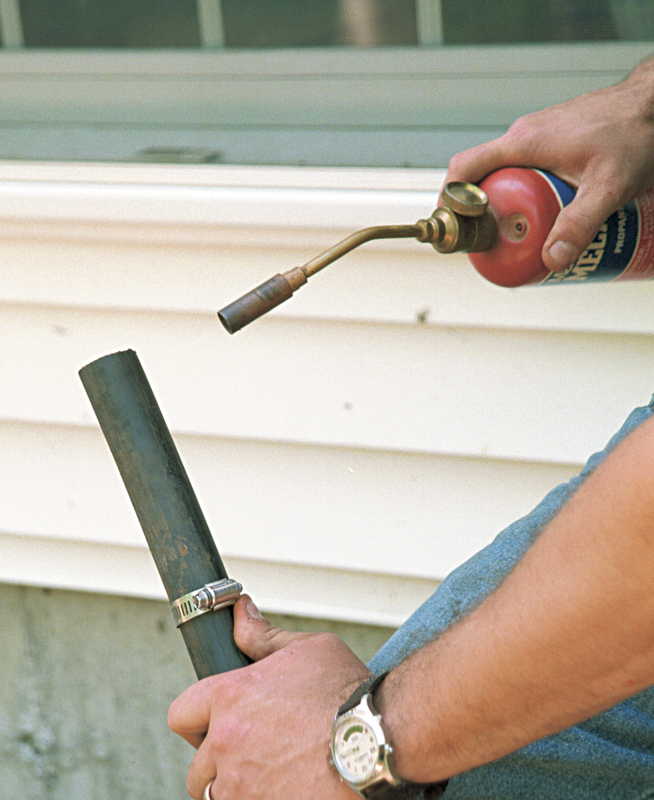 Too much heat can cause the line to distort, which could cause leaks at the connection. After the fitting was in, I positioned a clamp near the end of the irrigation line and tightened it securely. The T-fitting has a female threaded end that the spigot goes into. To ensure a tight seal, I wrapped Teflon tape around the threads on the spigot before screwing it into the T.
With the first box all set, I moved onto the main connection box, again making sure as I walked the trench that the line rested on the bottom. 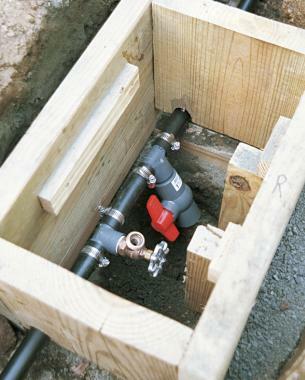 The main connection box was a little more complicated to set up, because it houses both a spigot and a drain valve, separated by a short length of line. I positioned the spigot so it would be uphill from the drain. That way, when the drain is opened, all the water will evacuate. 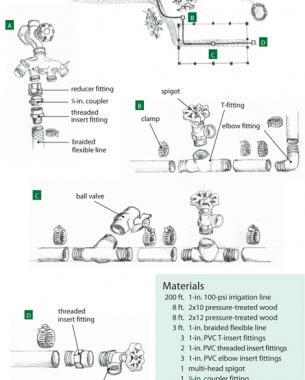 As in the first box, T-fittings provide connection points for the spigot and the drain valve. Be sure, when making all connections, to slide on the clamps before the fittings are put on. Otherwise, you’ll be taking the connections apart and doing it over again, as I learned the hard way. In the last connection box I put an insert fitting in the end of the line and capped it with a spigot. Heat the irrigation line with a propane torch, evenly all around. Heat the line just enough so you can pound the connection in with a rubber-headed mallet. Move the clamp toward the end of the line, over the fitting inside. 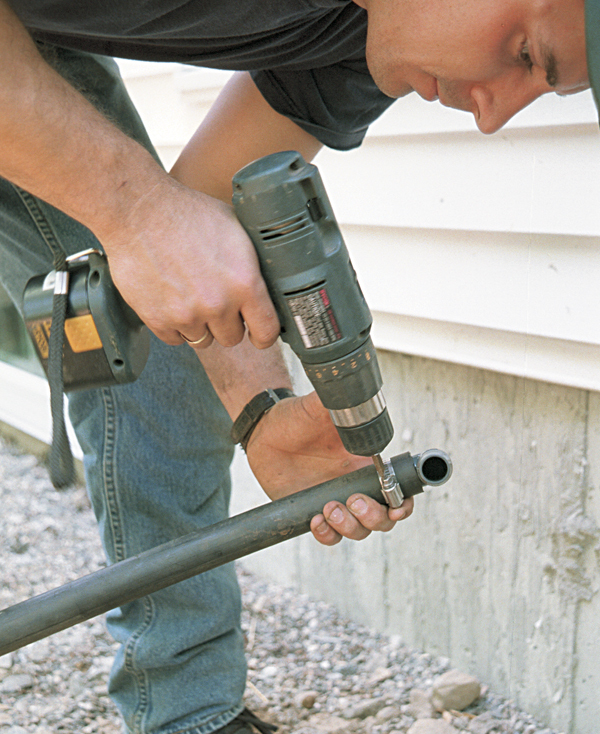 A cordless drill tightens the clamp quickly. Where sharp turns are needed, use an elbow fitting. Finish tightening the connection with a screwdriver. 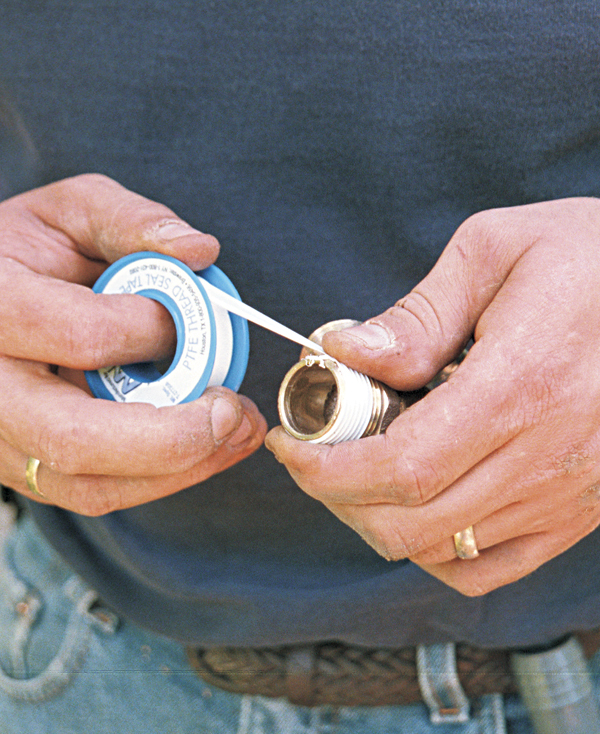 A layer of Teflon tape wound over the threads of all threaded connections is important anti-leak insurance. 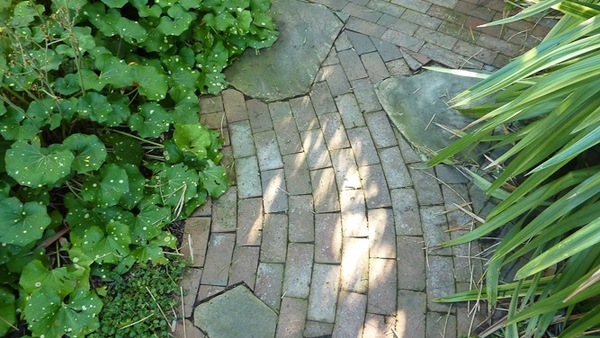 The main connection box at the center of the garden is the low point in the system. Here, there is both a spigot (for running water to the sprinkler) and a drain valve. When the system in drained in the fall, water will run out and seep away through the gravel bed beneath the box. 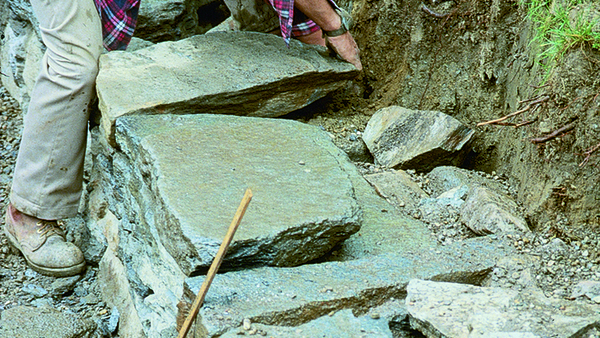 Once the system has been activated and searched for leaks, backfilling the trench is the final chore. After all the connections were made and all the clamps tightened, it was time to test the lines. Before turning on the water, I opened the spigot at the end of the line to push all the air out of the system. With the water running and the air purged from the line, I closed all the spigots. Then, holding my breath, I walked back along the line and inspected each connection. No leaks at all! I left the water on, keeping the system pressurized, for a couple of hours to see if any leaks developed. Once I was satisfied the system was water-tight, I backfilled the trench and graded the surface flat. I will eventually put a set of steps in the area where the line comes through the stone wall, but for now all I did was lay the line in the trench, cover it with a foot of sand and gravel, and lay a big flat rock across it. To drain the system at season’s end, I just open the drain valve in the central box (first making sure the water is turned off at the house), then disconnect the line at the house, and finally open all the spigots along the line. This system cost me under $300, including renting the trench digger, and the whole project took less than 30 hours to complete.